The U.S. Environmental Protection Agency (EPA) / U.S. Department of Housing and Urban Development (HUD) joint Lead; Renovation, Repair, and Painting Program Rule (RRP) will affect paid renovators who work in pre-1978 housing and child-occupied facilities, including: renovation contractors, maintenance workers in multi-family housing, painters, and other specialty trades. Under the rule, child-occupied facilities are defined as residential, public or commercial buildings where children under age six are present on a regular basis. The Initial Course takes 8 hours. Classroom training (including a written exam) requires approximately 6 hours of the total time for the course, and 2 hours are set aside for Hands-on Skill Sets in the Lab involving 11 skills evaluated by the instructor. Registration information is provided at the bottom of this page. Completion of the course will register your name with EPA as a Certified Lead; Renovation, Repair, and Painting Professional. The company you work for, whether it is a multi-person operation or you are simply a sole proprietor, will still need to register as a Certified Firm with EPA. To complete that application go to EPA's online Certified Firm Registration page. The Refresher Course takes 4 hours to complete. Certified RRP Contractors must complete a refresher course within 5 years of initial certification to maintain their standing with EPA. Registration information is provided at the bottom of this page. Certification courses are offered every month. To see when the next session is, visit this site's home page and look under the Upcoming Trainings Menu. 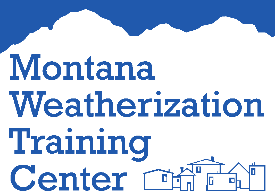 You can register from the Upcoming Trainings link, email us at classes@weatherization.org, or call the Center at (406) 586-0004 to reserve a spot. Preregistration is required. The RRP Initial course is 8 classroom hours and costs $200.00 per person; the Refresher class is 4 hours and costs $125.00 per person. All training materials are provided. The University reserves the right to cancel programs if the registration minimum of 6 students is not met. If you are registered and confirmed, you will be notified 48 hours in advance, should the class be canceled. In this event, the University’s liability is limited to the full refund of your registration fee. * Course fees apply for professionals NOT covered by Montana's Low-Income Weatherization Assistance Program (LIWAP) Funding. Refunds will not be issued for cancellations, made by the student, received within 48 hours of the course. If you are unable to attend, a substitution can be made at any time without charge.